Note: We are distributors of the IKAN series of marine books. These books are included on this page, but we also have a separate IKAN website which covers further details of the books and the authors. FISHES - AUSTRALIAN, and Indo-Pacific waters. (Includes titles covering the world, if Australia is not forgotten). Daphne G. Fautin & Gerald R. Allen. "Clown fish" are popular with underwater photographers because they are attractive, and sedentary. But the real fascination lies with their relationship with the poisonous anemonefish. This excellent book gives an insight into the relationship, and how the anemone fish is 'immune' to the poisonous nematocyst sting that is fatal to other fishes. It also provides an exceptional guide to species identification of the fish and their symbiotic hosts. A valuable and well produced book. Softcover, 160, full colour, medium format. Diversity - predominantly Australia and Indo-Pacific. Another excellent natural history guide from Australia'ss most prolific marine natural history writer.This is a most interesting book, with chapters dedicated to Territoriality, Feeding habits, the Mating Game, and Living Together, ie commensalism, symbiosis et al. A very important publication for the diver as it gives a better insight into the life of fishes. Softcover, 64 pages, full colour. The author claims this to be the first pictorial natural history book on the biology of Australian marine fish. It provides a basic understanding of the life and behaviour of fish - why do fish school? ; how do flounder change their spots, camouflage and defense mechanisms. A worthy read for any diver. Softcover, 64 pages, 150 full colour photographs. AUSTRALIAN SEA FISHES NORTH 30 degrees SOUTH. Large format reference for species from north of Abrolhos Islands (west coast Australia) and Coff's Harbour (east coast Australia). All copies are new but have a faded spine where they have been exposed on a shelf. Note: Coleman's Australian Sea Fishes South 30 Degrees South is out of print. Hillary Hauser, with photographs by Roessler, McKenney, Tzimoulis, Doubilet and others. COASTAL FISHES OF SOUTH-EASTERN AUSTRALIA. No doubt one the finest book on temperate water species produced in Australia. 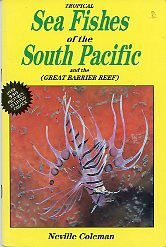 An excellent guide to southern water species and a companion volume to Fishes of the Great Barrier Reef. Superbly produced once again by Tony Crawford. And it is great to see the many years of hard work by the author, one of Australia's finest ichthyologists and fish photographers, come to fruition. A must for all divers. Softcover with plastic liner, large format, full colour, 460p. Graham Edgar, Peter Last and Malcolm Wells. This full colour, 176 page hardcover book with dustjacket represents excellent value and is an excellent guide to the temperate waters surroundings Tasmania, and the islands of Bass Strait and southern Victoria. The 142 colour photographs cover the maajor species seen by divers, with twenty species that have never previously been illustrated or scientifically described. This full color reef creature identification guide contains exquisite underwater photos of over 1000 marine species, from the Great Barrier Reef, Papua New Guinea, Solomon's, Vanuatu to New Caledonia. Along with the descriptive information to identify each species, the book includes interesting behavioral and habitat information. The author, Bob Halstead, a degreed educator and scientist, is a household word in the Indo-Pacific diving industry and has made more than 7000 in the Coral Sea to amass this collection of photos. Bob, winner of multiple photographic awards, has authored several books, and published dozens of magazine articles. Another superb book in the IKAN series, produced by Helmut Debelius, published by Sea Challeengers. Note: This refers to fishes of Australia, including temperate, tropical and freshwater species, as well as crustaceans. GUIDE TO SEA FISHES OF AUSTRALIA. There are several ‘guides' to Australian fishes, but none to compare with this excellent comprehensive reference book which covers some 950 species, all with a colour photograph, most showing the fish it its natural habitat. The text is brief but informative and each is accomanied by a location map. This is a work of dedication by Rudie Kuiter and a must for all divers. The book is standard size, softcover, no less than 430 pages. Edited by Dr. Martin Gomon, Dianne Bray and Rudie Kuiter. $125.00. Fishes of Australia's Southern Coast brings together the latest scientific knowledge on more than 860 species inhabiting Australia's temperate southern waters, from the Recherche Archipelago at the western end of the Great Australian Bight to Wilsons Promontory in the east, many found nowhere else. Those included range in size from tiny gobies and clingfishes less than 3 centimetres long, to the Whale Shark, the largest fish in the ocean, reaching a length of 12 metres. Thirty expert ichthyologists from within Australia and overseas have written accounts of all species known to occur within the area. Each species treatment is accompanied by one or more images (most in high-quality colour), a distribution map and a description that includes information on recognisable body features, size attained, colouration, habitat and other common names, as well as anecdotal information of interest to the reader. Where relevant, counts for fin elements, scales, teeth, photophores and other body parts are given. Illustrated keys are included at all levels of classification from subphylum to genus and species. Introductory chapters outline the scope and geographical coverage of the book, describe the variety of aquatic habitats in southern waters, discuss conservation and other issues associated with human impacts on fishes, interpret fish lassifications and provide detailed instructions on how to use the book. This book is the only recent Australian guide to comprehensively treat all fish species found within a region. It enables fishers, those interested in natural history, students and researchers to identify the fish fauna found along the southern coast. Hardcover, 928 pages, large format 260 x 186mm, full colour. Edited and annotated by Joan M. Dixon and Linda Huxley. Thomas Nelson, Melbourne. 1985. ISBN 0 17 006541 3. Hardcover, cloth boards, dustjacket, A4 size, 210 pages, referenmces, index, Includes appendicies - Gazetteer of Donald Thoimson localities; Glossary of Aboriginal; nmaes and meanings; Glossary of scientific and ASboriginal names. Mammals account for about three-quarters of the book. 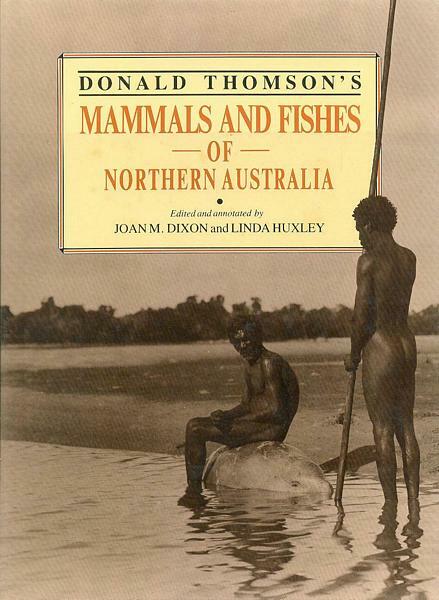 From the front fly blurb: Donald Thomson's Mammals and Fishes of Northern Australia is a unique record of the work of a brilliant zoologist and anthropologist far advanced for his time. This superb collection of his original black and white plates, taken in the harsh conditions of northern Australia, shows a remarkable diversity of Australian fauna, their habitats, and also the native inhabitants of the north. The text includes notes from diaries and records which Thomson kept on his travels as well as details of individual animals in his collection meticulously edited and annotated by Joan M. Dixon and Linda Huxley. Each species covered includes original notes by Thomson, locality map, comments by the authors and where possible, an identification photo and measurement table. This book is an important contribution to Australiana — it is only now, when the Australian continent, its native people and endemic fauna are under such intense public as well as academic scrutiny, that the endeavours of Donald Thomson can be understood and fully appreciated. Although produced predominantly for the aquarium enthisiast, this excellent book is also a most valuable identification guide, with one specie per page. The fish is well identified with a photo, followed by relevant text: size, range, aquarium suitability, and captive care. The latter information provides a wealth of information on the biology of the specie. The range as described is predominantly the north coast of Australia, the Indonesian Archipelago and north to the Philipines; and into the western Pacific. Softcover, 446 pages, full colour throughout, maps, common-name index, scientific name index. Sorry, no longer available from us but may be in print. Despite the name, replaces the book listed below. Indicated on cover as Fourth Edition. MARINE FISHES OF THE GREAT BARRIER REEF AND SOUTH-EAST ASIA. This is another excellent book illustated by the marine artist Roger Swainston, and also Jill Ruse, comparable (but larger in size) than the excelleent temperate water book Sea Fishes of Southern Australia in which Swainston collaborated with Barry Hutchins. The description of each species is brief and is accompanied by a full colour drawing of the fish. Text is on the left hand page and all illustrations accompanying the text is on the right making it idal for fish identification. (Lower image is of the older edition). PHOTOGRAPHIC GUIDE TO SEA FISHES OF AUSTRALIA. This is a full colour handy guide of over 300 species in temperate and tropical waters, useful as a pocket guide to use on a dive trip or as a handy reference. Its layout makes it particularly useful as an identification guide. Habitat and biology details are included. Size 95 x 190 mm, 144 pages. SEA FISHES OF SOUTHERN AUSTRALIA. 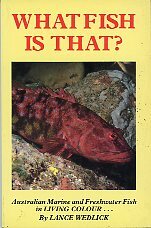 The most popular of all the fish identification titles ever published in Australia. Many hundreds of superb colour drawings next to a limited text provide the most concise guide to southern species. A must for all serious divers. This excellent full colour book is ideal as an on-site field guide and easy home reference, economically priced, and yet with excellent colour photographs, one to five per page, and detailed text, surely the best value of the marine identification books. Covers the Indo-Pacific, South-East Asia , west Pacific and northern Australia regions. Book is 125 X 170 cm, full colour throughout, 158 pags). Softcover, stiff boards, A5 portrait, 64 gloss art pages. Full coloiur throughout, index. (including Great Barrier Reef, Coral sea, Fiji and Adjacent waters). A plastic card 15 x 23 cm, with some seventy fish drawings in full colour, for use underwater, designed for fish identification whilst diving. The drawings are based on the book Fishes of the Great Barrier Reef by John Randal et al. Australian Marine and Freshwater Fish in Living Colour. Softcover (stiff boards), slightly less than A5 portrait, 136 pages, preface, no index. Once upon a time was the bible for all Aussie divers and fishermen, but more of a collectors item now even though text is relevant. Appendix includes Poisonous and Harmful Fish, and Fishes with Poisonopur Spines. New copies available with slight shop scuffing on covers. Please see above at beginning of webpage. M. & R. Burton. Introduction by Dr Gareth Nelson, American Museum of Natural History. It covers the three main habitat environments of fishes - tropical and temperate sea waters, and freshwater fish, "giving the reader a comprehensive view of fish", with detail on fish protection, habitat, characteristics and anatomy, feeding and reproduction, and any other pertinent habits. A very informative book. Earl S. Herald. (Curator of the Steinhart Aquarium, Californian Academy of Sciences). Published 1961, with this second printing in 1969. ".... the collection of photographs, both in colour and black-and-white, is incomparably the richest of its kind, inclduing many species and activities never before recorded". "Herer are literally thousands of little-known and almost incredible facts: fishes that lay their eggs out of water and then spalsh them till they hatch, other that lcoate food by electrical discharges, male fish that incubate eggs"... etc. Indeed a very informative bookIf the photographs are anything to judge by, it is also a most useful book for the marine aquarist. Hardcover, dust jacket covered in protective adhesive platic with small crease, A4 size, 298 pages, mono and colour photographs index, bibliography. Time-Life Books. Editor Maitland A. Edey. Although published way back in 1964, I still find this to be one of the most useful, interesting, informative and easy to read books on fishes. And lets face it, nothing much has changed in their ecology during the past half century. Its one of the few books in icthyology that you are tempted to read from cover to cover, or to browse a chapter or two at random, or just look at the pictures. It is by no means an identification guide - that is not the aim. It covers all matters of biology, with many interesting an unusual features and occurances. Still a very important book. Hardcover, printed cloth covers (no paper dustjacket), 192 pages, full colour throughout, index, bibliography, common and scientific names. $20.00. We have a few copies for sale in good to very good condition. A Waterproof Guide for Divers and Snorkellers. Paul Humann and Ned Deloach. Have you ever wished you could take your ID books with you underwater? Now you can! This waterproof mini-book of 12cm x 15.5 cm is ideal for keeping in your BC pocket and/or dive bag. 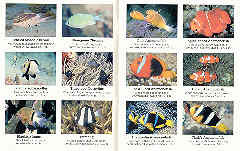 The 24-page booklet contains 132 color photographs of the most commonly sighted reef animals in the tropical pacific, so it is useful for anywhere from the Great Barriewr Reef to PNG, Micronesia and across to the Solomons, Fiji, Vanuatu and French Polynesia. There are brief tips on how to identify the species, size of each species. and arrows pointing to distinguishing marks to make this a most useful underwater reference. $16.00. Sorry, no longer available though us but still in print. The coral reefs of South East Asia harbour the greatest species diversity of all the oceans, not only for fishes, but also for invertebrates. With twenty thousand islands within the triangle Okinawa, Malaysia and eastern Indonesia, the reefs and coastal fauna is remarkable. Once again, the remarkable Helmut Debelius has compiled a wonderful volume of the marine life within the area, covering southern Japan, Indonesia, Malaysia, southern China and Taiwan, Vietnam, Thailand, and the western Micrinesian islands of Yap and Palau. The islands of Sipadan, Flores, Bohol, Cebu, Bali, Ambon, Palawan and many more feature regularly throughout the book. Over 1,000 photographs, all taken in their natural habitat, cover all marine life - the fishes, crustacea, miolluscss, the soft and hard corals, the worms, and the echinoderms. And like all the other IKAN series books, twenty-two two-page picture stories add to the intrest and knowledge of the marine life: Anemone City, Master of Mimickry, Mouring for Napoleon etc. Most of the photographs are those of the author, with additional images from excellent photographers including Halstead, Kuiter, Steene and Tatsuuma. Hardcover, laminated boards, 320 pages, full colour. $76.00 An IKAN Series book. A Guide for Snorkellers Divers and Aquarists. A very well presented book which also shows where to dive and snorkel on Hawaii's main islands. Some 230 species of fishes are covered with half- and third-page full colour photographs. The text assists in further identification and provides a short biology. INDO PACIFIC FISH GUIDE - MALDIVES TO THE PHILIPPINES. Indo-Pacific fish, especially those living in the coral reefs of Southeast Asia, comprise the world's greatest variety of species. This book featuring more than 800 coloured photographs provides divers, aquarists and tourists with a perfect overview of all the ocean fish encountered in the reefs and open waters off the islands and coastlines of Thailand, Burma, Malaysia, Indonesia and the Philippines. Softcover, 153 pages, colour. $28.00. Softcover, 152 pages, over 800 colour photographs covering the major species in SA Asian and tropical waters, including the Coral Sea. An ideal identification guide, with up to eight photos per page, several paragraphs of text description per family, and minimal description of the some 700 species. An excellent value-for-money book, suitable for identification and information at home or for travel. Publ;ished in 1967this authoritive work has had many impressions. The book is divided into the various classes and orders, with four or five species drawn in colour on each colour plate. And the drawings are exceptional. Hardcover, dustjacket, 134 pages, colour drawings, index to latin names. $35.00. Copy is in very good condition, with a slight mended tear to the top of the jacket. A photographically-illustrated guide to the 400 or so species of reef and shore fishes that are likely to be experiences in the Maldive islands (Indian Ocean). Soft, 192p, 260x195mm, 475 colour prints. No date indicated but probably published in the 1980s. Divided into the various families, with extensive text. Photographs are generally colour, half-page. Copy is in excellent condition. First printed in 1974, this book has remained a major reference on the subject. The authors, scientists and divers, are French, living in Tahiti, and their credibility is without question. The subject matter is centered on French Poilynesia, from the Gambier and Austral Islands north to the Marquesas, and thus includes Rangaroa, Bora-Bora, Moorea. and Tahiti. After a description of the region, and a chapter on fish biology, the book is divided into the major families, with large clear photographs and sufficient text. From the Maldives to the Pacific Islands, including Great Barrier Reef and PNG. Although here are several ‘fish identification' books on the market, none really assist in showing you what to look for in the identification o a species. Sure, colour, shape and size are pedominant clues, but there are othr subtle features that need to be identified closely. Take the wrasse family for exampl. Many species are may appear similar, but suttle signs of colour, spots, and fin shape, to name a few, are highlighted in this book by an arrow to the relevant part, making identifiaction easier, quicker and more certain. The brief text indicates common and scientific name, topography where found, goegrapohic location where found. Here we have over 1400 colour photos covering 105 fish families, from the open sea to the reef. Photo Guide to FISHES OF THE MALDIVES. As would be expected from this well respected author and undrwater photographer, this is a superb book with over a thousand photographs. The layout is excellent and designed for identification. Text is concise yet sufficient. Softcover, full colour on gloss art paper, 256 pages. Sorry, no longer available and out of print. MEDITERRANEAN AND ATLANTIC FISH GUIDE. From Spain to Turkey; from Norway to South Africa. Another brilliant title by Helmut Debelius. The impressive photographs, authoritive text and excellent layout make this a superb book, and more than adequately complements the others in his series. Species include those found off the United Kingdom coast and western Europe; the Azores, Madeira, Canary Islands, Ascension Islands, remote Saint Helena, and St.Paul's Rocks; the west coast of Africa down to the Cape; and of course the Mediterranean. A brilliant book. Harcover, full colour, 303 pages. Gerald Allen, Roger Steene, Paul Humann, Ned Deloach. Covers the tropical region right across the Pcific from Indonesia through to French Polynesia, which includes Malaysia, Thailand, Vietnan, Papua New Guinea, Solomons, New Caledonia, Fiji, Samoa and Tonga - and although not listed, woul include the Micronesian islands also. A comprehensive guide with more than two and a half thousand photographs of over 2000 species, taken in their natural habitat.Six close-cropped colour photographs per pagewith brief description and habitant range. The book is unique in that it is segmented into descriptions based on the shape of the body, the ‘slender schoolers', those with ‘large lips', those thatswim with their pectoral fins (parrotfish and wrasse), those with ‘big eyes', the ‘cryptic crevice dwellers', the ‘odd-shaped bottom dwellers', the ‘odd swimmers', seahorses, eels, sharks and rays. Do you knew the difference between a Pickhandle barracuda and a Blackfin barracuda? The subtleties that define a species are clearly indicated. A suberb and most useful publication, particularly as it includes those fishes of the central and western tropical Pacific. Includes separate common name and scientific name indexes. Laminated board cover, 480 pages, full colour throughout. Plastic laminated board covers, 240 pages, full colour throughout, common index, family index, log pages for sightings. Approx. three colour photos per page, with brief desiption, drawings to aid identification showing specific characteristics. General family and species description includes distinctive features, abundance and distribution, habitat and behaviour, and reaction to divers (unique - ueful). The most comprehensive fish guide to the Galapagos islands, ‘a naturalist's fantasyland, so exotic that it alters the course of Western thought'. 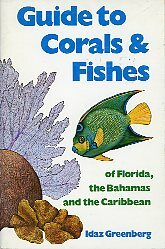 GUIDE TO CORALS AND FISHES OF FLORIDA, THE BAHAMAS AND THE CARIBBEAN. An International Oceanographic Foundation Selection. Softcover (srtiff board) , about A5 size portrait, 64 pages, full colour drawings throughout, index, notes. "This book shows 260 species of corals and fishes in full colour with an accurate, easily understood text". Includes 'Look, but don;t touch, chapter. New but slightly shop scuffed on cover, hardly noticeable. INDIAN OCEAN REEF GUIDE. Helmut Debelius. Another superb title from one of the world's finest icthyologists and marine naturalists - and a superb photographer. His books are perfect, for identification and general knowledge of the species covered - usuaally three of more photos per page, with concise text. The proeduction of all his books is excelent. This book covers the complete Indian Ocean rim, inclusing of course Western Australia, Cocos and ChristmasIslands, the Maldives, Sri Lanka mauritius, and down the eastern African coast. Covers the reef invertebrates, fishes, corals, and even the odd shipwreck. A wonderful book, as would be expected from Debelius. Foreword by Sir Peter Scott. Softcover (stiff boards), A4 size portrait, 192 pages, full colour throughout, index. From the back cover blurb: The dream of every diver and snorkeler is to visit the Red Sea and explore its fabulous coral reefs, for theyrank with the most spectacular in the world. The Red Sea !s warm, clear and undisturbed by the strong wave action of the major oceans. Surrounded by desert, it escapes the freshwater run-off that causes turbidity. Its marine life is diverse and colourful. Of all the plants and animals in the sea, none are more captivating than the reef fishes. They present a bewildering array of form and colour, and observing their behaviour is a delight. 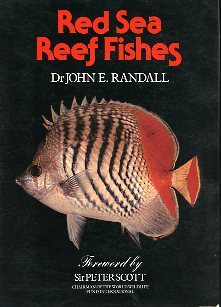 This book describes in detail the most common and conspicuous reef fishes of the Red Sea and has been written by a world authority on tropical marine fishes, Dr John E Randall. His text, accompanied by 446 of his superb colour photographs, covers 57 families of Red Sea reef fishes with each of 325 species separately detailed, including remarks on how to distinguish the fish from related species, the size it attains, its geographical distribution and something of its habits. An excellent modestly priced book on the marine life of The Red Sea, with 355 full colour photographs, diving into two sections - The Fishes, and Invertebrates and other Sea Animals. The introductory section includes a background on the red Sea, Dangerous Marine Cratures, Coral Reefs, Snorkelling and Diving, and Underwater Photography. Stiff board covers, 128 pages scientific and common name index. The Sea Fishes of Southern Africa was first published in 1949, with many revised editions through to 1986. It ha slong been the feinitive work on the icthyology of South African waters, covering the east and west coasts of southern Africa, Mosambique and the then Portuguese East Africa. The first 34 pages cover general 'notes about fishes', their classification and nomenclature, ancestry, and environmental comment. The majority of the book covers the verious species with mono photographs, drawings, and full page colour plates. The text is extensive with detailed descriptions for positive identification. We have two copies available. 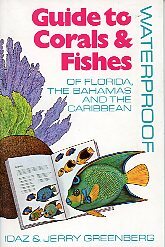 It would help if the book was titled more accurately, or at last subtitled - this book covers "the many fabulous fishes that are found in the waters of Southern Florida and the Bahamas". The author is (was? )manager and curator of the Miami Seaquarium, who found a need for a single book "that could be used to identify most of the fishes found in southern tropical waters". Southern as per northern hemisphere of course. As perhaps to be expected, the colour photographs appear to be all taken in an aquarium. Hardcover, dustjacket, larger than A4 format, 128 pages, full colour throughout. Published in 1975. $20.00. Copy on offer is in excellent condition although edges of dust jacket are scuffed. A modestly prices book which also covers invertebrates and other marine animals. The introductory section includes a background on the Maldives and the formation of the atolls, Dangerous Marine Cratures, Coral Reefs, Snorkelling and Diving, and Underwater Photography. Stiff board covers, 128 pages scientific and common name index. Gerald R. Allen, Roger Steene, Mark Allen. An excellent book concentrating on arguably the most popular species of fishes. Each page contains one full colour half-page photograph, with detailed text (habitat, characters, remarks, distribution), and a distribution map. Very useful for divers and aquarium keepers. Hardcover (laminated boards), 248 pages, full colour. Helmut Debelius, Hiroyuki Tanaka, Rudie Kuiter. A Comprehensive Guide to Pomacanthidae. In keeping with all TMC publications in this series, this is a superb book with over a thousand colour photograph of eighty-eight species over eight genera. Includes information on habitats, behaviour, colour morphs, hybridisation and aquarium reuiremnts if you are so inclined. A marvellous identification guide and refernce text. First pubished in 1978.79, they became the definitive work on the two families, and a standard reference for many years. For the technically minded, we are talking about the families of Pomacanthidae and Chaetodontidae. Both authors are well rspected in their fields, Steene as a marine enthusist and exceptional underwater photographer, and Gerry Allen as an icthyologist and marine scientist. The images are in full colour, generally half or quarter page, showing female, male and juvenile in many instances. The text is about a third of the page. Voilume One also covers Papua New Guinea and regions of the Indo-Pacific. Index of scientific and common names, and literature referenced.There are some five hundred photographs over the two volumes. Hardcover, dustjacket. Now well out of print. Volume One: 144 pages. Volume 2: 352 pages. A Comprehensive Guide to Chaeltodontidae and Microcanthidae. Just released - another excellent book in the specific species series authoured by Rudie Kuiter. Over 130 species of butterfly and banner foshes live in tropical seas, some living down at 200m. This comprehensive book is illustrated with several hundred full colour photographs, with many species photos published for the first time. Includes introduction to genera and subgenera, information on behaviour, habitats, hybridisation, and bsic details of aquarium requirements shopuld you wish to keep them in captivity. Printed hardcover, 208 pages, fulll colour throughout. A TMC Series book. CLOWNFISHES. A Guide to their Captive Care, Breeding and Natural History. This is an extremely informative book if you want to get into the nitty-gritty of what makes Nemo tick. It has been written for aquarists wishing to raise the species, however because of its detailed content on breeding and natural history, its audience is far reaching, and includes the diver, underwater photographer and general observer. Likewise, the chapers on breeding and raising provide in-depth knowledge of the species that relates back to their natural habitat. Such an understanding provides the casual observer and underwater photographer with knowledge that enhances the enjoyment of appreciating these delightful fishes, be they in their natural habitat or as a bred species. Softcover, medium format, 240 pages, full colour throughout, many photographs and diagrams, index, bibliography, sources and contacts. $65.00 Sorry, no longer available. Published by the Natural History Museum of London. A well produced book on not too large a size, covering the 'coral fish': the butterfly and angelfish, damsels, anemonefish, groupers and seabasses, wrasse; the grazers and crushers, the bottom-dwellers, the nocturnal fishes, and the hunters.Commences with an overview of the coral reef environment and communities, the diversity of the species and biology. Very good, clear photographs. Very much relevant to Australia and the Pacific. A Comprehsive Guide to selected Labroids. Detailed information on the families, genera and more than one hundred known species. Around 1500 photographs. Hardcover, laminated board covers, 208 pages. Well indexed with common and scientific names. In the same series as Surgeon Fishes and their Relatives, Seahorses and their Relatives. REEF FISHES (COLOURFUL LITTLE). Helmut Debelius. 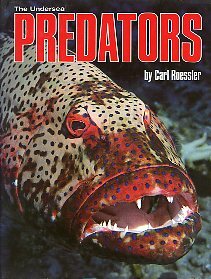 An excellent value hardcover book, and the definitive guide to the small tropical reef fishes that we see hovering in and around coral heads - the Basslets, Tilefish, Hawkfish, Cardinalfish, Damselfish, as well as Blennies and Gobies. Debelius' work is always informative and interesting to read, matched by appropriate mono and full colour photographs. 160 pages, hardcover. Excellent value - limited numbers available. There is no finer author, photographer and researcher than Rudie Kuiter on one of the most popular of marine fishes, the Seahorse. Having written many books and papers on seahorses ands pipefishes, Rudie has produced a most magnificent book on the subject, certainly the definitive work, in one large volume covering the world's known species. Hardcover laminated boards, A4 size, 333 pages and in full colour throughout, we have here a book that covers over 370 diferent species including recently found animals, illustrated with more than 1200 exceptional photographs taken in the fishes' natural habitat. After an Introduction where the Seahorse is described in general, a detailed Classification appears, together with a more detailed description of seahorse identification. A chapter on Seahorses as a threatened species preceeds a detailed section on their distribution and origin. The Seahorse in the private aquarium consumes several pages as does the more professional aquaculture of both tropical and sub-tropical species (with an extensive contribution by Tom Bowling of the National Marine Science Centre at Coffs Harbour). There is a distribution chart for Australia with a mono pages of twenty-six ‘shapes and sizes' for identification - and then we have the body of the book, with four to fourteen or so colour photos of each specie, including of course various stages of development from egg to juvenile to adult. Hardcover, laminated boards, colour throughout, 333 pages, index, glossary, reference literature. As I said - the definitive work. Hardcover (laminated boards), 240 pages, more than 1000 exceptional photographs and lone drawings covering 350 species, the total of known species in the world. Once again Rudie Kuiter has put together a superb refence book; and the publisher has completed the job with fine layout and quality paper. Some of these animals are weird, some equisitly beautiful, others have unusual mating and gestation behaviour - and why shouldn't the male carry the eggs? An excellent reference for the marine biologist, scientist, naturalist and serious amateur diver. SURGEON FISHES, RABBITFISHES AND THEIR RELATIVES. A Comprehensive Guide to Acanthuroidei. Helmut Debelius and Rudie Kuiter. Another superb book from these two well-known authors, photographers, and icthyologists. It covers in some detail the families, genera and the more than one hundred known species in the world, illustrated with several hundred superb underwater habitat photographs. The information provided is particulaarly useful for all levels of interest, from the casual, to scientific, including detailed information for those perating marine aquariums. Hardcover, 220 pages, full colour throughout. This excellent book is subtitled ‘Your Complete Guide to the Underwater World', and covers both the techniques of fishwatching, and a biology of fishes and invertebrates. A very useful title. Softcover, 230 pages, with colour plates, and line drawings. Hardcover, dustjacket, A-4 size prtrait, 192 pages, index, fulkl colour throughout. This is not just about sharks (which take up just twelve pages0, but all the fishes and invertebrates that prey on other animals - which is just about all of them! Chapters include Hunter Who Cannot Move; Those that Move, but Slowly; The Walkers and Stalkers; Creatures that Glide; The Swimming Bowsers; Odd Couples; Masters of Disguise; Defence; Ambush! - Sudden death on the Reef; Children of the Night; and finally - Thge Classic Predators - Sharks. The final chapter is, of course, Man-The Final Predator? Roberta Wilson and James Watson. "Understanding Coral Reef Fish Behaviour". This is a fascinating book, giving a greater understanding of the marine world - reproduction and social life, territoriality, symbiosis, food and eating, mobility and swimming. it is easily read, the authors ensuring that the answers are given to the many curious questions that confront anyone interested in marine life - how do fish smell, (terrible, some might say), how can a clownfish live amongst the poisonous 'tentacles' of an anemone, why do fish 'school', why are coral reef fish more colourful than pelagics? A most valuable book. See also AUSTRALIAN FISH BEHAVIOUR - Neville Coleman. Above. SHARKS & RAYS - Elasmobranch Guide of the World. No other book worldwide gives so much information on so many species - 240 in fact, with over 600 photographs, and 33 picture stories that have made the IKAN series so popular. Includes also for the first time deep sea species taken from submersibles in their natural habitat. A detailed and comprehensive description for every depicted species is provided. Location of each photo is indicated. Approx. 320 pages, full colour throughout. A remarkable guide; a must for the diver and marine naturalist. AUSTRALIA'S SHARKS AND RAYS . Predominantly a basic identifuaction book with good sized photographs and sufficient text top describe each species. Would make a nice gift, or a basic primer on sharks and rays. Large format, 64 pages, softcover. BLUE MERIDIAN. The Search for the Great White Shark. Author and diver Matthiessen followed internationally acclaimed underwater cinematographer Peter Gimble in his quest to film the Great White, travelling to the Caribean, Indian Ocean, Sri Lanka, and ‘the bleak south coast of Australia'. This is an excellent read for anyoen interested in marine life, particularly sharks. It includes quite a bit on Australia including the attack on Henri Bource. But this is not a book of sensationalism. It is exceptionally well writen and considers not only the attitudes of those on the expeditions, but also shows a greater understanding of the creatures that they were out to film. Hardcover, dustjacket, 162 pages, mono plates. Published in UK by The Scientific Book Club, London, in 1965. 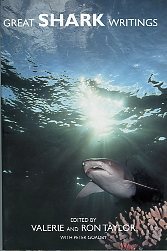 The book is adapted from Sharks and Survival by Dr Perry W. Gilbert, published in the USA, with permission from the American Institute of Biological Sciences. Hardcover, dust jacket, 190 pages, a few line drawings. "Shark attacks, always a serious menace, have increased greatly in the last few years. There are many reasons for this increase. Since world population has been growing so rapidly, the mathematical chances of a shark encountering a man have risen accordingly. The proportion of the population who can afford to travel to beaches, who learn to swim, who buy boats, water skis and deep sea fishing equipment, is very much larger than before. Also, the phenomenal growth of the popularity of skin diving has brought substantial numbers of people face to face with the shark under water in a whole new set of conditions. Lastly, sharks have probably become more abundant." The book claims to "give the facts to a reader who is not sure whether a shark will attack him on sight, attack only when attracted by blood, or never attack at all unless badly provoked". The book was apparently developed by the author from scientific papers given at the New Orleans Shark Conference, called by the Office of Naval Research in 1958. Mrs. Butler has written chapters on the continuing search for effective shark repellents, and helpful advice on public safety and first aid. $25.00 Good second-hand copy with dustjacket in protective library sleeve. DIVING WITH SHARKS and other Adventures Dives. Beautifully photographed and presented, this is an interesting books for those who have ventured beyond the odd dive at the end of the jetty. Covers the fascinating experieinces of diving with sharks, whales, dolphons, manta rays, and turtles, potato cod and sea snakes, with locations throughoput the world, including Australia of course. There is an informative section on diving in strong currents, and wreck diving covers twelve sections including the Yongala, Andrea Doria and Truk Lagoon, and of course the Prsident Coolidge. Finally, the chspter on closed overhad environmnts includes cavern and sinkhole diving, and under the Antarctic ice. A very interesting read, informative and beautifully presented. An appendix provides a brief directory of locations with a star graded system for experience required. Softcover, large A4 format, 160 pages, full colour througout. A vewry informative book, going beyond just identification and dispensing with the sensationalism normally associted with ‘shark books'. In seven excellent chapters it give a greater understamding of these magnificent creatutes: Shark Success, Ecology and Biology, Sence and Supersenc, Design for Living, Design for Killing, More Sharks - or Fewer?, Shark Talk. Softcover, large format, full colour throughout (and very well designed), 192 pages. $36.00 Sorry, no longer available. Norman Caldwell, in collaboration with Norman Ellison. Angus & Roberston Limited, Sydney and London, 1939. Hardcover, no dust jacket my copy, 309 pages, no illustrations except a cartoon of the author. The autobiography of a commercial shark-catcher in Melbourne who once saw a ‘horrible looking brute' off St Kilda and ‘decided to catch and kill sharks at every opportunity'. A very interesting read; how fortunate we have moved in from these days when ‘shark fishing (was) a grand sport'. Note: The dust jacket shown is off a paperback, 1966. The original 1939 edition probably had an embossed cover with the title and author, abd probably never had a dust jacket. We have created a pseudo dust jackeet for the hardcover edition based on the cover of thr paperback - not a reflection on the original of course, but it looks good and protects the book. $34.00 Second-hand, facsimile dustjacket as mentioned, in protective library cover. Daly, Stevens, Last and Yearsley. By the authors of the acclaimed CSIRO publication Sharks and Rays of Australia (now out of print), this excellent field guide allows easy recognition of species. A step guide to identification is not only useful for iots purpose, but extremely informative in showing how the species vary. The identification section contains two species per page, each with a full colour photograph, and details on habitat, teeth, full description of characteristics. A very useful book. Softcover, 84 pages, full colour throughout, common name and scientific nme index, biblography. Softcover, 326 pages, no index, no images. Richard Ellis and John E.McCosker. With original photographs by Al Giddings and others. It is billed as 'the definitive look at the most terrifying creature on earth', and were it not for the impressive authors, one could be forgiven for thinking that this is just another book of emotive drivel. But with the names of Ellis, McCosker and Giddings on the cover, you have to look further, and for good reason. Great White Shark turns out to be, indeed, the most definitive work on the species. The photographs are graphic without being sensational, and the text combines biological material with anecdotes, experiences, myth and public conceptions. A truly excellent book. Softcover. medium format, 270p, full colour. Franco Prosperi. Translated by Camilla and Guido Roatta. First published 1955, Hutchinson & Co. (Publsihers) Ltd, London. Hardcover, dustjackt, 216 pages, mono and colour plates. From the fly: Dr. Franco Prosperi, who is a Roman biologist, was the leader of a party of three high-spirited young Italians who, having become fully experienced in the new sport of underwater fishing in the Mediterranean, pioneered it in the waters of Ceylon in 1951. Lord of the Sharks is the exceedingly engaging account of the experiences of three young men enjoying themselves im- mensely in very novel surroundings - a gay and youthful book, but one with its serious side. Franco was not content merely to stalk and kill fish with his underwater harpoon gun, but also filmed and photographed them, took scientific notes and collected specimens. Franco, Paolo, and Carlo arrived in the Indian Ocean with no previous local experience to guide them, but at least they had no fear of the sharks. They found themselves able to deal wjth them - as the remark able illustrations show - though there were awkward moments during their first encounter and on a later occasion when Franco was filming the harpooning of a shark by one of his companions, and was nearly drowned because he was entangled with the harpoon line and was dragged away when the shark fled. The expedition,. well equipped in other respects, was short of cash. They therefore supplemented their funds by selling part of their catch, which ranged from lobsters to sharks, and included a quaqtity of curious submarine creatures. Indeed they were offered permanent employment as shark-killers by an enterprisihg Ceylonese merchant. By buying a rickety sailing craft with an unreliable auxiliary engine they increased their mobility and sold her again on their departure from the scene of their exuberant explorations. $35.00 Second-hand, excellent condition, facsimile dustjacket in protective library cover. True Tales of Terror from the Deep. Softcover, 204 pages, no index, no illustrations. Peter Davies limited, London, 1962. Hardcover, dustjacket, 223 pages, mono prints, bibliography, no index. It says that the author was at Harvard Univeristy before joining the RAF in WW2, which does not tell you anything about the credentials of the author. (My cousin was at Melbourn Univeristy for many years, as a gardener). The author was unfortunatel;y lost at sea when hunting sharks off the Californian coast, and probably did not get to see his book in print. It contains quite a wealth of information and is a good read. $34.00 Second-hand, excellent condition, with dustjacket in protective library cover. 1963 SHADOWS IN THE SEA. The Sharks, Skates and Rays. Thomas B. Allen. SHADOWS IN THE SEA. The Sharks, Skates and Rays, by Harold W. McCormick, Tom Allen, and Captain William Young. Now available in softcover updated edition, 354 pages, mono photographs, index, bibliography. I still maintin that this is the best book on its subject that I have read. Divided into four parts: Shark Against Human, Human Against Shark, Consider the Shark, Shark and Company - it is not an identification but more directed at the life and times of the shark species and their relationship with man - sorry, with ‘humans' as the latest edition has been politically updated. I am convinced that Peter Benchley read this book and went off to write Jaws, for the basic theme in Jaws was a true story, as related in Shadows in the Sea. A wonderful book, one of my favourites, and a great contribution to our selachian knowledge. To anyone who has bathed in tropical waters the word 'shark' has a very special significance. Nothing in the great and mysterious silence of the ocean strikes so much fear as this sinister, deadly, and evil-looking fish, the terror of the shipwrecked sailor, the scourge of the crowded beaches of Australia, and one of the most unusual and fascinating creatures in the animal kingdom. One can look at the shark from many different points of view. Biologically it is peculiar, for it has no bones. So perfectly strong and simple is its design and so well suited to its environment that it has survived virtually unaltered from prehistoric days before the animal world began to form bone. The rat-race of evolution has passed it by. Then there are shark attacks. Can they be anticipated? What sharks are dangerous? What is the best protection? There is the mystique of the shark in the religions and tribal rituals of. many primitive peoples. There is shark fishing, one of the most thrilling and dangerous of sports. There is the shark as big business, for his skin, for his oil, for his high protein value. And, to a much greater extent than most people realize, there is the shark as food; not just such rarities as the famous Chinese delicacy 'shark's fin soup' (with its cruel and wasteful killing), but, under many disguises and pseudonyms, shark meat is eaten and enjoyed everywhere - and there is a section of recipes. This is a complete monograph on the shark and its related species, the skates and rays: authoritative, thoroughly researched, well illustrated, and compulsively readable. Secker and Warburg, London; 1953. Hardcover, dustjacket, 272 pages, mono photographs. I thoroughly dislike seeing photographs of dead sharks and abhor those who kill them for pleasure. For that reason I chose not to read this book all the way through, but my initial judgement of the book was incorrect. Apart from the adrenalin that must rise when the hunt is on, these men, from the villages of Mull and Muck and Rhum and Eigg, off Scotland's west coast bordering thje Sea of the Hebrides, did not take to the sea in their tiny boat just for the fun of it. This was their living, hunting, killing and returning to shore with their catch so that they could feed their families. Fair enough, but I still don't want to go into detail. But from the little I have read, I must say this is an exceptionally well written book. I can recall a revierw of it many decades ago and always promised myself that I would read it, not knowing that one day I would came to appreciate these "fishes" so much. If you are into the understanding of sharks, and the people who live off them, read this book; it is quite brilliant. $24.00 Second-hand copy, excellent condition but no dustjacket. Leonard Compagno, Marc Dando, Sarah Fowler. One of the small Collins Gem guides: physcally small, 80 x 115mm, but big on information. A very handy pocket guide of 180 different species of sharks world-wide with an introduction to shark anatomy, reproduction and evolution. Each species is details with location of habitat, conservation status, size and diet, breeding and of course a good general description. Softcover, 224 pages of packed information. Five Mile Press (Distributors for Readers Digest)., Sydmey, Australia 1997. Hardcover, dust/jkt, full colour throughout, 288pages. Peter Last and John Stevens. At last, after over a decade as a much sought-after out of print book, and fourteen years since the first edition was released, this remarkable volume has been updated and reprinted as a second edition. It is the definitive work on elasmobranchs, by two respected Australian research scientists/icthyologists at the CSIRO. And it's a huge book, weighing in at over 3 kilos, hardcover, dustjacket, A4 size, 644 pages, colour photographs, maps, drawings, charts, an extensive index and reference bibliography, and a separate identification colour plate section. Did I say photographs - I am not so sure - they could be colour illustrations by Roger Swianston, so well done that they are hard to distinguish from photographs. The bulk of the book is divided into chapters on each of the families, showing distribution (worldwide, not just Australia), and specific details for identification, ie general description, gills, colour, size, distinctive features. Teeth identification is important and well illustrated. This is not a book to read in bed - you won't find any gory shark attack cameos here - but you will keep the book at hand. Written by academics yes, but concise, clear and distinctly readable. $120.00 Sorry, no longer available but may still be in print. Spectacular photography, with scientific analysis and biological charts, drawings and graphs. This is not one of those 'popular' sensational books on 'man-eaters' , death and destruction. Nor is it simply a picture book on sharks. Nor is it a guide to shark species. Sharks - Myth and Reality is a sensible expose of the life of the shark, the habitats and specific characteristics of the various shark species. Sure, the Great White is mentioned, but the other species dominate for space, includiunng the harmless reef sharks and the huge whale shark. This is quite a superb publication. (Howard Hall's photograph of a Blue shark chomping into a school of squid is quite remarkable). Photographers include Australians Kevin Deacon, Kelvin Aitken, Bill and Peter Boyle, Ron and Val Taylor, and Parer Cook who I presume is Elizabeth Parer Cook; also Bob Halstead, David Doubilet, Carl Roessler et al. Very large format (260x360mm), 144 pages full colour on quality art paper. There is a Warning on the cover of the book - "This book contains distrubing photographs". This is not a publisher's gimmick. A sixteen-page centre section in the original hardcover edition was indeed fully colour sealed. The photographs of shark attack injuries are truly disturbing and may distress the reader. This is a well researched and valuable addition to the library on shark behaviour, and includion of the photographs of shark attack victims is appropriate. Needless tosay, Rod Fox and Henri Bource are included, so nothing new here, but some of the South African images are both horrifying and yet remarkable in that (some of) the victims survived.How many of the 354 shark species are man-eaters? How and why do sharks attack? How many attacks are there a year and how many of these are fatal? How can shark attack be repelled or avoided altogether? Maniguet answers all these questions without being afraid of challenging received ideas.Best known as a survival specialist, he is also a doctor of medicine. This is perhaps the most interesting book on sharks since Shadows in the Sea, and Coppleson's Shark Attack. Well written, interesting and a valuable text. The author, Xavier Maniguet, died in an aircrash in March 2009. Maniquet, 62 years old, was an experienced pilot, a flying instructor, who was killed when a gust of wind caught his aircraft on the Etendard glacier near the French alpine resort of Saint-Sorlin-d'Arves. he was a remarkable man, skilled in many outdoor purssuites - an expert diver, a parhutist, an acrobatic pilot, sailor, and medical doctor specialising in diving injuries, hyperbaric medicine and aeronautical health. He was also an author of several books on survival - and The Jaws of Death. What is little known, except no doubt by the New Zealandd police, is that he was one of the men responsible for the sinking of the Greenpeace flagship Rainbow Warrier in Auckland in 1985. Added to his career cv is the fact that Maniqquet was a French secret sservice agent, and his role in the demise of the Rianbow Warrior and photographer Fernando Pereira who was on board that fatal day, was to smuggle in the explosives on the yacht Ouvea which out the Rainbow Warrior on the seabed and sparked exuberant international dialogue, especially between New Zealand and France. Still as a secreet agent, he later was involved in the secret service mission to free French hostages in Somalia just recently. He was quite a man. THE SECRET LIFE OF SHARKS - The Mysteries of Shark Behaviour. around underwater seamounts, Dr. Klimley learned that hammerheads rely on sophisticated tracking of ocean-floor magnetism to navigate. His long-term study of great white sharks off the California coast demonstrated that these huge sharks prefer to eat seals and sea lions because of the energy contained in their fatty bodies. They are selective eaters, not the man-eaters we expect, and they sometimes go weeks between meals. But Dr. Klimley did observe a ritualized behavior that great whites practice in order to avoid deadly disputes over prey that one shark has captured and another wants. attacks.Hardcover, dustjacket, 292 pages, mono prints, source material, index. $48.00. A Definitive Investigation of the 1916 New Jersey Shark Attacks. READER'S DIGEST - EXPLORES SHARKS. A good, concise book expertly written as would be expected from Readers Digest. Covers the environment, identification, behaviour and intehration with people. Full colour, medium format, 160 pages, hardcover, dustjacket. There are dozens of books about sharks, but what makes this one special is that it reads ‘like a novel' with person experiences interspersed with fact - and legend. A very interesting book for anyone interested in these magnificent creatures. Softcover, 294 pages, colour and mono prints. Documents sharks atacks throughout the world looking at the reasons for the attacks and determining if there is a pattern (ie rougue attacks), and what causes the attacks. Seeks also to determine shark behaviour in the various species, and which sharks are prone to attack. Extensive section on Australia. SHARK ATTACK! The Dangers Lurking in Australian Waters. Not another book on shark attacks, you may well ask. Published in 2003, it does bring us up to date with more recent attack, particularly the three tragic attacks in the year 2000. It also, of course, covers some of the other fatal attacks that have made headlines at some time or other, and includes the tales of survival from such men as Rod Fox and Henri Bource. For education and amusement, there are sections on shark legends, shark mysteries (The Shark Arm Case naturally), what to do to avoid shark attack (go to Ayers Rock!! ), shark humour and if you want to get your own back, shark recipies. And how the great Aussie golfing loser (sorry, legend) Greg Norman got his rather inappropriate nickname. The author is a Melbourne based journalist, and fisherman, who claims a love-hate relationship with sharks. This is a well written book, very interesting, and despite the cover, does not gratuitously exploit the ‘danger' of the shark, but tells it as it is. Softcover, 256 pages, some mono prints. SHARK ATTACK. Dr. Victor Coppleson. A Study of Swimmers, Surfers, Skin Divers, Shipwreck Survivors and Sharks. This is the major work on shark attacks in Australia and overseas up to the time of its publication. It is both authorative, scientific and entertaining and although quite senational, it is not written for that effect. The author is Australian. Hardcover, dustjacket, 266 pages, many mono prints. First published in 1958. Now well out of print. We occasionally have good quality second hand copies, with original dust jacket when available, or computer generated cover taken from the original. Shark Attacks in Australian Waters. A good read, and more up to date than Coppleson. Includes Fox and Bource - and the incredible Shark Arm Murder Case. Paperback, 164 pages, mono photos. A good book should provide both entertainment and education. Hugh Edwards has done this admirably in an excellent book about one of life's most misunderstood creatures. He examines the reversal of human attitudes toward sharks since the 1950s when the only good shark was considered to be a dead one, and shows how public opinion had gone full circle and now ensures their protection. Combining real-life incidents with natural history, the author has provided a book which will give the reader a much better insight into the life of the shark, and their place in the oceans. He covers the myths and the mysteries, the tragedies and the terror, at all times relating back to the shark, and the human, psyche. A very important book to give us a greater understanding of these incredible creatures. Softcover, 360 pages, colour plates. $26.95 Info on the author. 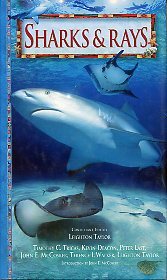 Published by the Natural History Museum of London, this is an interesting book at great value covering shark biology and behaviour, 'the world before jaws', great whites and their relatives, requiem sharks, shark attack, and a number of other chapters. Not for species identification - for a better understanding of these magnificent creatures. Softcover, medium format, 112 pages, full oplour, index, further reading, internet rsources. $28.00 Just the one copy left. A handy identification and fact book, well designed with good photographs and text. A quality production. Just the book to have at hand when a quick identification is required. And the text is informative. Small format, softcover (laminated folded card), full colour throughout, 96 pages, index. $20.00 Only the one copy left. Angus & Robertson Ltd, Sydnet et al. 1963.
sharks and rays was the last of his writings, for he died just as it was finished. A lively, readable book, it is simply written but provides precise s<;:ientific information. It deals with all the known species of sharks and rays in our waters, ranging from familiar and harmless species like the Port Jackson Shark to oddly named. creatures like the Angel Shark and Goblin Shark and dangerous monsters of terrible aspect like the Great Sawfish and the Black Stingray. The author begins by des- cribing in a short general chapter the form of the sharks and rays, the differences between them and the true fishes, their breeding habits, and so on. lIe then takes the species in turn, examining them and their habits in more detail. Some of the best reading in the book concerns shark attacks and their typical pattern, in which David Stead took a special interest. Most of the species are illustrated, there is an appendix for lhe more technically minded reader that gives the classification of the various species, and the book contains a useful index. $26.00 Its a scarce book, and considering its information value, a desirable book to have for anyone interested in elasmobranchs. Sorry - but we have sold our one copy. Victor Springer & Joy Gold. This has been put out by the Smithsonian Institute so has some measure of credibility from that fact alone. There are dozen of "shark books' on the market, but I am always on the lookout for something that is new, interesting and informative. And this book meets the criteria. It is divided into five sections - part one answers some thirty specific questions - do sharks sleep?, how long do they live?, how do they detect prey, do they make sounds? ; part two covers ten ‘super sharks', and what characterises their species - the great white, whale, hammerhead, blue, thresher etc; part three covers shark attack, and a very sensible coverage it is; part four concerns Sharks and Us - of what use are they to us, can we learn more; part five contains a classification. There is also an glossary, a very comprehensive bibliography, and an index. Softcover, colour plates, mono drawings, 186 pages. The author is a well established ichthyologist and prolific author, with a particular interest in the Red Sea. This excellent volume covers the bilogy of the region's sharks, evolution history, man's involvement with sharks - and follows with a classification of the species found. Hardcover, dustjacket, A4 size, 148 pages, mainly line drawings and paintings with some photographs. Written and photographed by a well known icthyologist and diver who lives in Tahiti, this book has been in print since 1978, with another edition in 1984. During its time it was a standard referenc on the subject. Chapters include: the devine predators, the benevolent benefactors, man and the marauder. These are followed by an extensive section on each specie indicating morphology, dustribution, habitat, repoduction, feeding and disposition, the latter being most intriguing. Softcover, 170 pages, full colour throughout with some line drawings, index, bibliography. SHARKS OF TROPICAL & TEMPERATE SEAS. Excellent full colour standard book format guide. Includes identification and biology, with an excellent coverage on behaviour, perhaps one of the most useful books on the subject. Many photos. No longer available - was reprinted as Sharks of Polynesia. SHARKS - SILENT HUNTERS OF THE DEEP. Many contributors. Published by Reader's Digst. Arguably the finest book on sharks - factual without sensationalism, yet fascinating to read. Marvellous photographs. Contributors include Perry Gilbert, Peter Goadby, Ron and Val Taylor, Scott Johnson, Noel Kemp, Nick Otway and Julian Pepperell, all marine biologistss or someone with a great affinity and knowledge of the subject. The book is divided into three sections - World of Sharks considers its biology and habitat over six chapters. Men and Sharks considers the relationship between us and them, and thus centres on shark attack, and protection, with some fascinating stories - and covers the incredible Sydney aquarium 'Shark Arm Murder'. The final six chapters, in Facts About Sharks and Shark Attack, includes a few fallacies, and global patterns of attack. The full colour photos and many diagrams are excellent as would be expected from Readers Digest. Hardcover, dustjacket, full colour throughout, 208 pages. $48.00 Sorry, no longer available. Now well out of print. Well worth trying to fiond a second-hand copy. John A. Musick & Beverley McMillan. A Scientist Tracks the Consummate Preditor. This is a very entertaining and educational book, very well written in a first-hand narrative manner. It contains a wealth of information on sharks and shark behaviour from original research and actual experience by the authors. I was fascinated by their research on drag, the friction of the shark body that retards in-water speed; their heating mechanism that allows the warm-blooded creatures to survive in cold seas; the ‘bite-and-spit' procedure of shark predatory movement, and of course their remarkable ability to ‘smell'. An original and important work in the fascinating field of the elasmobranchs. Hardcover, dust jacket, 242 pages, index, and not a single photo or drawing - just the facts. WHALE SHARKS - The Giants of Ninagaloo Reef. Knowledge is important but having an affinity with the subject is the essence of a great book. It takes only minutes to realise that author Dr Geoff Taylor has all it takes to write, photograph and produce a memorable book, indeed a valuable contribution to marine science. Yet Whale Sharks is an immensely readable book and one that anyone interested in the sea would enjoy. The photographs are superb - and interesting - something lacking in many books on marine life. The text is fascinating being both educational and entertaining. I have only experienced diving with a whale shark once but Taylor's book has brought back many memories. For those who have not had the real experience go to Ningaloo - or read Whale Sharks. Hardcover, dustjacket, A4 size 176p, full colour, bibliography, index.